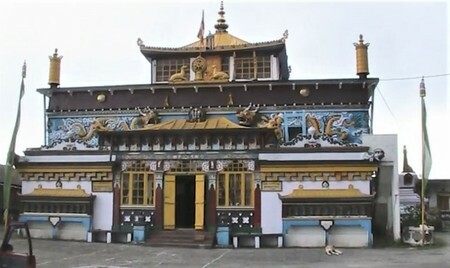 Yiga Choeling Monastery of Ghoom is one of the oldest Tibetan Buddhist monasteries in Darjeeling area built in the year 1850. This is the original or the old Ghoom Monastery. There is another monastery called Samten Choling Monastery in Ghoom which is also sometimes referred as Ghoom Monastery by the local drivers. So if you are planning to visit the original Ghoom Monastery, be specific and mention old Ghoom Monastery. Ghoom is about 7km from Darjeeling town and located at an altitude of about 7,407ft. (or 2,226 meters). Located below Ghoom railway station, the external structure of the Yiga Choeling Monastery or the Ghoom Monastery was built by the monk and a famous astrologer Lama Sherab Gyatso in 1850. He was the first head of the monastery and continued his tenure until 1905. He later went back to his birthplace Tibet. The Monastery belongs to the Yellow Hat sect also known as the Gelupka. One of the key attractions inside the monastery is the 15-foot model of the Lord Buddha which is known as The Maitreya Buddha or the Gyalwa Shampa which means the Buddha of the future or the Coming Buddha. This is one of the biggest and oldest statues of Buddha in Darjeeling area. This statue was created with clay that was all brought from Tibet. In front of the Buddha's statue there are two huge oil lamps that keep burning all the time and all through the year. There is a charge for taking photograph inside. When I took my last picture, it was Rs. 10/- per photo and Rs. 50/- for a video shot. The cash needs be to be dropped into the donation box. There is a board outside that clearly talks about the charges, and a monk inside reminds you of the same. I wondered why such forced donation when some of the other monasteries in the area simply don't allow you to take pictures inside and the rest do not even ask for money. I learned that for the last several years the monastery is going through severe financial crisis. Some of the grants that it earlier received for its operational expenses have been pending for decades. One of the only ways that the monastery today runs is by way of donations. And hence the charges. The 15-foot statue of the Buddha was constructed during the tenure of the second head of the monastery Lama Domo Geshe Rinpoche (1910 - 1952). He too later went back to Tibet. 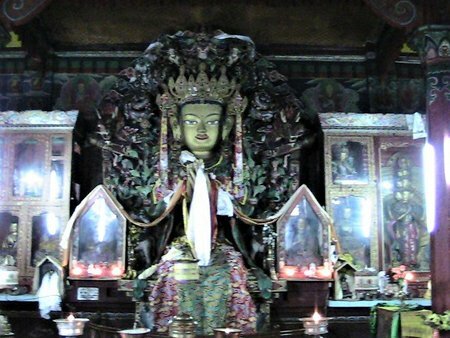 Inside the Yiga Choeling Monastery there are images of many Buddha deities and lamas such as the Chenrezig (Avalokitesvara), Buddha of compassion, and Tsongkhapa who was the founder of the Gelupka sect to which the Monastery belongs. There is a large collection of Buddha's manuscripts inside that includes a 108-volume Kangyur - The Tibetan Buddhist Gospel. There are also bells and a huge drum inside. So what else can you see in Yiga Choeling Monastery premises? Views!! Magnificent views!! Facing the monastery if you look towards the left, you get sweeping views of the snow capped peaks including the Kanchenjunga. Although the view is somewhat blocked by a long tinned shade to provide a seating area for visitors, if you look through the opening on a clear day, you will be awe struck. You can also get the marvelous views from outside the main gate of the monastery. All days a week, early morning till evening. Ghoom Monastery or the Yiga Choeling Monastery is located about 8km from the Darjeeling town. It takes about 30 minutes to reach the monastery by car from Darjeeling town center. Before Ghoom railway station and on the Hill Cart Road (the main road that goes all the way to Siliguri), you will need to take a right turn into a narrow road. After about 2-3 minutes drive from there and right at the end, you will find the monastery. See Ghoom & Its Map to find out the location of Ghoom Monastery. From Ghoom station, the monastery is about 10-12 minutes walk.